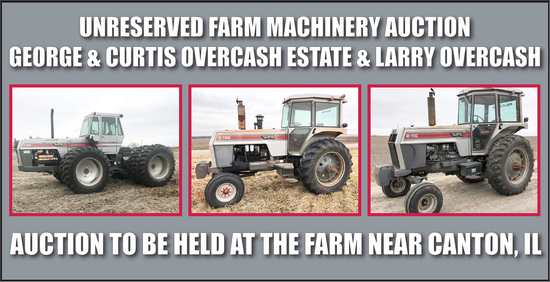 Selling tractors, grain truck, planter & tillage equipment, grain carts & other farm equipment. Internet Premium Cap: 2.5% What's This? Payment Instructions: All purchases must be settled at the end of the auction by cash, credit card, personal check or wire transfer. All purchases made with a credit card will have a 3% convenience fee added to the total. Contact auction company to make payment arrangements. Shipping Instructions: All equipment must be picked up by the buyer. Any & all shipping & trucking costs will be paid by the buyer. Equipment to be removed from ground in a timely manner. Preview Date & Times: Items can be previewed the week of the auction. Checkout Date & Times: All equipment must be picked up by the buyer. Any & all shipping & trucking costs will be paid by the buyer. Equipment to be removed from ground in a timely manner. Driving Directions: From Canton, IL (Jct. of Hwy. 78 & 9), take Hwy. 78 north approximately 4 miles north to the small town of Norris, IL, then left or west on Hwy. 17 (CR 3000N) approximately 2 miles to Coal Rd., then right or north a short distance to the first farmstead on the west side. Or approximately 6 miles southwest of Farmington, IL. 2.5% Internet Buyer's Premium capped at $750 per item. NOTICE TO POTENTIAL ONLINE BIDDER: By registering to bid online at this auction, Bidder acknowledges that in exchange for the opportunity to bid on-line at this auction via Proxibid, Bidder agrees to allow Sullivan Auctioneers, LLC to send to Bidder by email, notices about its upcoming auctions. However, if Bidder wishes not to receive emails about future auctions, bidder will have the availability to opt out of any and all communications from Sullivan Auctioneers, LLC?s via future communications or can contact Sullivan Auctioneers, LLC at any time. You've been outbid to d****8! to YOU!